I finally finished “Darkmage” by M.L. Spencer. As I may have mentioned, I am an epically slow reader due to way too many demands on my time, so as usual this took me much longer than it should have. I was supposed to take part in a discussion about the book, but ended up dodging the conversation because I was only halfway through the book and didn’t want to be spoiled! 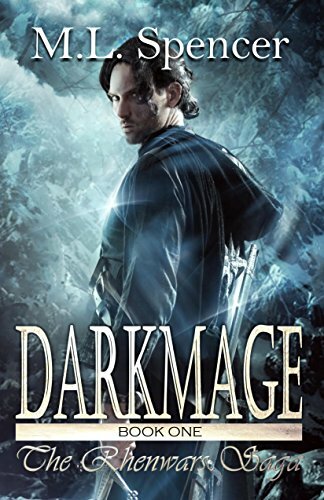 “Darkmage” reminds me favorably of C.S. Friedman’s Coldfire series. I imagine I may have even seen a few tips of the hat in that direction, though it’s hard to say if that is merely wishful thinking on my part. This is a story about a man who loses everything, which is the sort of tale that has always been dear to my heart. I enjoy exploring good and evil, and how pain and loss might tilt one’s choices in either direction. It’s one of the themes I explore in my own series, so it was of immediate interest to me, and Spencer delivers well on the concept. Darien Lauchlin, our protagonist, quite literally loses everything he loves, and at the same time finds himself possessed of tremendous power. That’s just the sort of crucible to refine a character. Without getting spoilery, I can assure you, Darien is in for a world of pain. Some of it is admittedly of his own doing, but by and large he’s had a really bad hand dealt to him, and none of his choices in responding are very easy. We’re talking about the sort of choices like “Should I just lie here and bleed out, or jump off a cliff so I suffer less, and if I aim well, also land on my enemy and kill him too?” It gets even more difficult as he encounters companions, whose fates then become entwined with his, and become part of his calculus. “Darkmage” hit on all cylinders for me. It was well written, well paced, and well told. Five of five stars, and I’m adding the rest of the series to my To Read list.